Metal roofs have a longer lifespan than asphalt and many other roofing materials. A metal roof system may cost a little more up front but it is very cost effective over the years. Some may think that a metal roof would add weight to your roof’s structure. In actuality, the distribution of weight per square foot actually makes a metal roof lighter than your common composition roof. 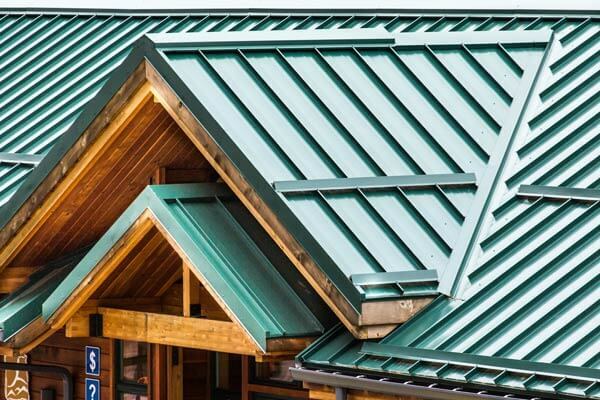 Metal is one of the most energy-efficient roofing materials available. Having a metal roof can save you up to 40% in air conditioning costs as well as provide excellent insulation during the winter. The basic unpainted metal roof will reflect more solar radiation than a composition roof, which typically absorbs and holds heat. Standing seam metal roof panels are incredibly easy to install. This means that Acme experts can install them quickly, reducing the inconvenience for you. With some roof systems, these panels simply snap into place to form a cohesive metal roof. 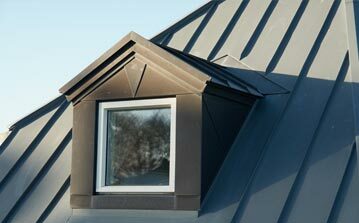 This roof type also reduces the number of seams in a roof, which is one of its greatest weak points. It also provides a smooth, sleek design. The seams on these systems run in a vertical direction and rest above the surface of the roof. R-Panel metal roofs provide a metal roof system that does not require much maintenance. This type of system is also known for its high degree of durability – it has a great ability to resist hail, fire, and winds of up to 140 mph, and a longer life expectancy compared to other types of roof systems. R-panel metal roof systems can be installed over solid substrate or open frames. Myth: Hailstorms fill metal roofs with dents. Hail storms can cause damage to all kinds of roofing materials, but metal roofs aren’t necessarily more likely to be damaged than other types of roof materials. These roofs are highly durable and do not dent easily unless they are impacted by very large hail. Myth: Metal roofs and rusting. Most metal panel roof manufacturers have a paint warranty of up to 40 years which eliminates any rusting issues. Metal roofs have a coating of rust-resistant metallic material, such as zinc, on them, which lowers the risk of having rust form. Myth: Metal roofs can’t handle being walked on. Metal roofs can withstand being walked on without suffering damage. We do not advise ever walking on your metal roof. If you have an issue, please contact us and schedule a free inspection.